All Dressed Up is proud to offer the full line of Ben Nye quality products, from individual make-up kits to special effects make-up, All Dressed Up has the film and theatrical make-up you need. We carry a full line of prosthetics for both theatrical productions and special events. Prosthetics are easy to apply and add a professional finish to any production or individual costume. From "Who" noses, to full facial prosthetics, All Dressed Up not only carries the product, but has skilled make-up artists on staff to either show you how to 'do it yourself' or can be hired to apply the appliances for you. 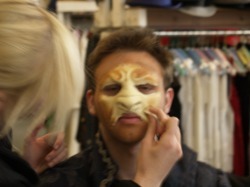 All Dressed Up also offers workshops on special effects make-up so you can learn to be an expert as well. The Make-Up Artists of All Dressed Up Costumes offer workshops throughout the year on stage and specialty make-up application for film or stage. We also offer workshops to schools and Theatre Clubs. We can either come to your location, or you can bring your young actors to us, and we design the workshop to your specifications, be it special effects make-up, prosthetic application for a specific production, or basics of stage make-up including old age and characters. 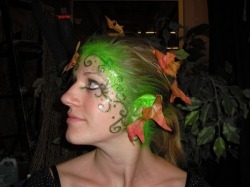 Creative face painting by staff artist and designer Laura Dwyer. Parties, picnics and special outings that focus on family are always more fun when someone is painting colorful designs and pictures on the faces of children (large and small!!). Complete facepainting kits and individual colors are available, along with workshops on advanced face painting techniques.